Spain is a dream destination for art enthusiasts from around the world with major galleries and museums in just about every major city. Even smaller towns will often have an important exhibition or at least works by important Spanish artists in its cathedral and churches. The history and culture of Spain is entwined in its art from the prehistoric cave paintings at Altamira to the surrealism of Salvador Dalí. As you travel around the country you’ll discover the incredible diversity of Spanish art resulting from the occupation of the Iberian peninsula over time by Phoenicians, Greeks, Romans, North Africans and Visigoths. Look out for Mozarabic art created by Iberian Christians living under Moorish rule then after the Reconquest of Spain by the Christians there is some fascinating works of Mudejar art created by Muslim artists under Christian rule. Centuries later bullfighting and flamenco dance emerged as key elements of Spanish culture which became a influential in many works of art. In terms of specific artists Spain’s “Golden Age” was during the 16th and 17th centuries with El Greco, Velazquez, Murillo and Ribera at the forefront. Goya was the shining light of Spanish art during the 18th century whilst the 20th century produced a wealth of talent thanks to the emergence of the likes of Picasso, Gris, Miró and Dalí. Spain’s most celebrated Renaissance artist was the Cretian El Greco who moved to Toledo where most of his main works were produced and can be seen throughout Spain, most notably in the churches of Toledo and in the Prado Museum in Madrid. Arguably the greatest Spanish painter in history was Diego Velazquez who is well represented in the Prado with works spanning his career including his masterpiece ‘Las Meninas’. The Prado is also the place to go to see some of the principal works of Francisco Goya. The most famous work by Pablo Picasso is his horrific depiction of the atrocities of the Spanish Civil War in ‘Guernica’ which can be seen in Madrid’s Centro de Arte Reina Sofia. As well as visiting Madrid, art lovers will be in their element in Catalonia and more specifically in Barcelona. The city’s architecture is dominated by the magnificent work of Gaudi including the stunning Sagrada Familia whilst the most popular art museum is the world renowned Picasso Museum. The Fundació Joan Miró and some excellent Catalan galleries are also in Barcelona whilst the famous Salvador Dalí Museum is in nearby Figueres. A guide to Madrid’s major art galleries & Museums in Madrid including the Prado, Thyssen and Reina Sofia. A guide to the art galleries of Barcelona including the world famous Picasso museum. As well as Madrid and Barcelona an art tour of Spain would not be complete without a visit to Bilbao which is home to the well known Guggenheim Museum and the lesser known but highly regarded ‘Museo de Bellas Artes’. A similarly named museum of fine arts in Valencia and its modern art museum have helped establish Spain’s third city on the European art circuit. Seville’s ‘Museo de Bellas Artes’ and Merida’s Roman Art Museum also deserve a special mention. Whilst Spain is home to some of history’s greatest artists, Celia Gimenez is not one of them. 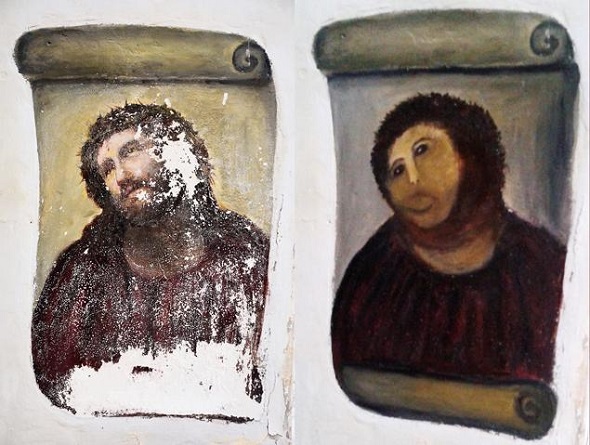 In 2012 the 80 year old amateur artist from Borja near Zaragoza decided to restore a 120 year old fresco of Christ in her church. You can see in the original painting below that he is wearing a crown of thorns but in the “restored” version he has been converted into what many commentators have described as a monkey. Apparently, once the media got hold of the story tourists flocked to the church to see Celia’s handiwork earning the church thousands of Euros (allegedly she requested royalties). Art historians believe her work can be reversed.